A waterfall is a wonder to behold. Its hydrologic rarity and power draw people to it. Central Minnesota was home to this natural feature, only you’d be hard pressed to find it today. The power that attracted the Dakota, the Ojibwe, and their forebears to the “little falls” is precisely what led later European/Americans in their attempts to harness the waterfall. The City of Little Falls, which takes its name from the waterfall known to American Indians and early explorers, got its start in 1849, when James Green, in partnership with Henry Rice, Captain N. J. T. Dana, John Blair Smith Todd, John Irvine, and Allan Morrison, built the first dam on the east side of the river. Imagine the waterfall as they would have seen it. It had two channels, split by an island (now called Mill Island). The western channel was higher and rougher than the eastern channel. Green’s dam was a wing dam. It extended out to the island across the eastern channel of the falls. This dam powered a saw mill, which may have originally been intended to supply the materials for the construction of Fort Ripley. Not long after the dam was built, James Green died of cholera and his co-partners sold the dam to William Sturgis, who operated it until 1854. At that time, Sturgis went into partnership with James Fergus and Calvin Tuttle and the men formed the Little Falls Company, later to be called the Little Falls Manufacturing Company. Using the dam as their focus, the men were determined to build a town. The precise fate of this first dam is difficult to discern, glossed over in the historic record. What is known is that the Little Falls Manufacturing Company intended to make improvements to the water power facilities, which included the construction of a new dam on the east side of Mill Island, with the goal to stretch the dam fully across the river. It was decided that the structure of the new dam would be better served if it were sitting on a nice level surface, so sand and gravel were hauled in and spread along the river bottom and the dam was built on this base. The eastern portion of the new dam was completed in 1858. In the summer of 1859, parts of the second dam were washed out by flooding on the Mississippi River, the sand underneath aiding the process. The dam was repaired, but washed out again the following summer. For decades, Little Falls went without a dam. An economic depression in the 1860s, followed by a slow recovery, made people tentative about harnessing the waterfall again. Finally, in 1887/88, a group of investors from Louisville, Kentucky, successfully completed the challenge and a third dam, this one covering the full width of the falls, brought industrial-strength power to Little Falls. The Louisville ­Syndicate, as it was called, was determined to reap the full benefits of their investment and worked tirelessly to draw businesses to the area to take advantage of the dam’s power. Pine Tree Lumber Company and Hennepin Paper Mill were two such businesses. The Louisville Syndicate was also involved, through their membership with the Chamber of Commerce, in drawing up a charter that moved Little Falls from village to city status. Prior to the construction of the third dam, the 1880 census showed a population of 508 people in Little Falls. By 1890, the population more than quadrupled, reaching 2,354 people. By 1895, it had grown again, more than doubling to a total of 5,116. The dam, and the industries it attracted, was a major factor in that growth. The third dam, which was made of wood, operated successfully for close to three decades. Eventually the dam weakened and could not meet increasing demands for water power. 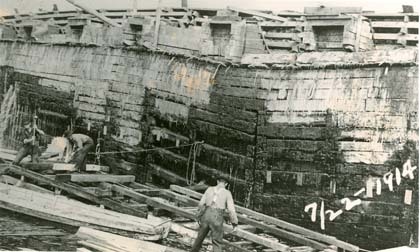 In 1914, construction started on the east wing of a new dam. Concrete was the material of choice for the fourth dam. In 1918, work on the west wing was underway, and, by 1921, with the addition of a new power house, the dam was complete. The fourth dam operates to this day (2007), the only evidence of the original waterfall at Little Falls. This photo shows the structure of the third Little Falls dam. Note that it is made of wood. The photo is labeled to indicate that the third dam is being repaired; however, from the date on the photo, July 22, 1914, the men shown could be preparing for the construction of the fourth dam. 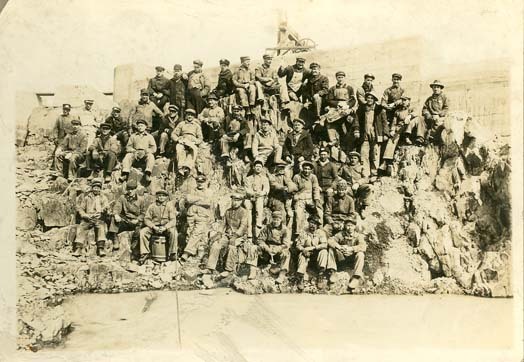 Crew that built the fourth Little Falls dam, 1917. Photo by Eirikson Studio,Little Falls, MN. Mrs. Catherine (Christ) Karnowski boarded some of the crew working on the dam. I am exploring the history of my paternal ancestors: the Yasgar and Lijewska/Lijewski Families. Are there any names of the men who worked on the dams? Were there any fatalities while building them? If so, are the names available? Hi, Susan – While Ann Marie checked into Yasgar artifacts in the collection, I looked for info on the Yasgar and Lijewska/Lijewski families in relation to the dams. A cursory search of our Power Company box and Yasgar family file turned up no mention of either family name related to the dams. We don’t have a Lijewska/Lijewski family file, so I struck out there. The Power Company box does not have a compiled list of dam workers for the Little Falls or Blanchard dams. A book on the history of Bowlus by Louis Titel, James Beniek and Tim Jendro has a chapter on Blanchard Dam, including one photo that shows dam workers. Of the men identified, none is a Yasgar or Lijewski. Louis found a couple of articles related to fatalities during Blanchard Dam’s construction – Otto Barton and Earl Seawall died in separated incidents and these are included in the book. Thanks so much for your question. Sorry we couldn’t be of more help.